Entertain guests outside on your new custom-built synthetic or wood decks. Deck Pros has the construction experience necessary to create your dream deck. We only use top-quality materials and focus on completing the job right the first time in a quick time frame. Add value and beauty to your property with a new fence. Our contractor provides fencing installations for homeowners in the surrounding areas, as well as repair work. Contact us today to schedule an appointment for your personalized consultation. 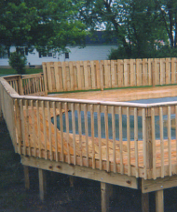 Deck Pros is a deck builder and fence contractor business, based in Dayton, Ohio, providing custom decks and fences at affordable prices. Our owner has been building houses since hes been out of school. He constructed log homes while working for a friend for 10 years and took over the business after the owner retired to continue providing people in the area with high-quality services. Customers enjoy our quick services and high level of quality work.